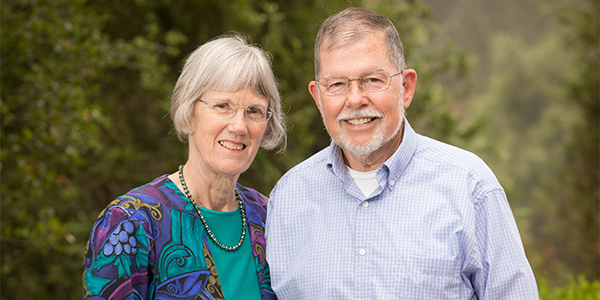 In the 50 years since they graduated, Steve and Christine Manchester Goudy have traced Westmont's influence in their lives. Christine grew up in a conservative Christian family and spent two years at Mills College before transferring. At Westmont, she put her love of learning and her faith together. "It was so refreshing to be in a place where I could be smart and be nourished spiritually," she says. Steve recalls the brilliance and humility of religious studies professor Robert Gundry, who explained various points of view, even those he rejected. "Faculty members thought about spiritual things and not just their discipline," he says. Westmont opened their hearts and minds to a wider view of the church. "God prepared us to be far more welcoming to people with different points of view and to focus on the essentials of the faith," Steve says. Hearing Francis Schaefer speak on campus made a lasting impact on them both. "He woke us up and took off our insular blinders," he says. After serving in the Navy, Steve started a finish construction business and later a custom wood products company in Southern California. As their two children grew older, Christine worked part time and served two terms on the local school board. Eventually she took a full-time position at Pasadena City College, earned a master's degree, and taught English as a second language. In 2003, they moved to Tennessee to be close to their daughter and her family. Steve continued in construction, and Christine became an administrative assistant at Oak Ridge National Laboratory, where her ESL training helps her connect with international scientists. The Goudys are actively involved in a seeker-friendly church, leading a small group and an anger management and recovery group. These Wallace Emerson Society members have made a provision for Westmont in their estate plan because they believe in what the college prepares students to do. They consider tithing an essential part of Christian life and seek to give more as their circumstances allow. Christine attended Westmont on a scholarship, and an anonymous donor provided funds when she was short. She wants to give back. "God has allowed us to be generous, and investing in His Kingdom is important to us" she says. Reproduced with permission from the spring 2018 issue of the Westmont College Magazine. For more information about how to include the college in your will or trust, please contact the Office of Gift Planning at (805) 565-6058 or giftplanning@westmont.edu.